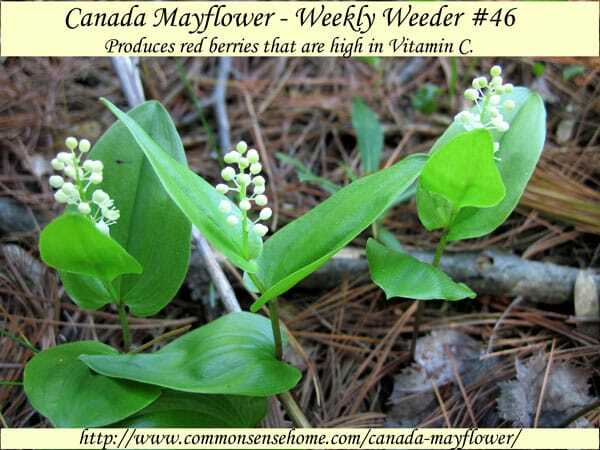 Today’s featured plant is Canada Mayflower, Maianthemum canadense. 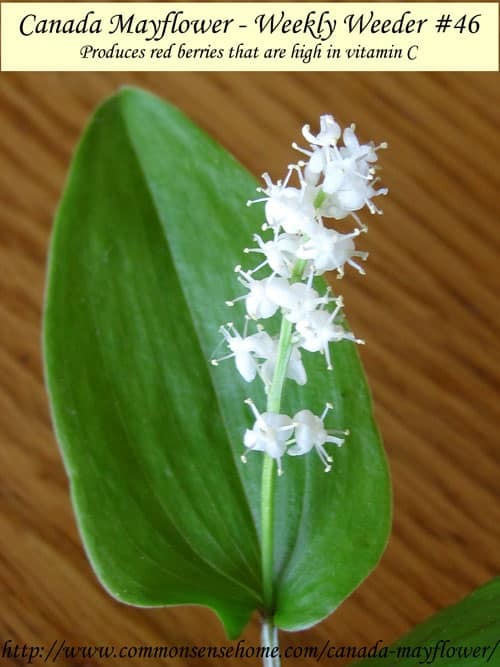 There are several related species, including Maianthemum racemosum, feathery false lily of the valley; Maianthemum dilatatum, false lily of the valley; and Maianthemum stellatum, starry false lily of the valley. Canada Mayflower is native to North America. It can be found throughout Canada, even into the arctic reaches, and in much of the United States, south to Georgia and west to Montana and Wyoming. (see map). It prefers shade, and can be found blanketing forest floors in both deciduous and conifer woodlands. Canada mayflower is a perennial, so it comes back year after year. It spreads by rhizome, so a patch of “plants” may actually all be connected to a single root system. Like its cousin true lily of the valley (Convallaria majalis), false lily of the valley flowers are very fragrant. I snipped a plant when we were taking photos and brought it inside to enjoy. Plants are low growing, only 2-6 inches in height (5-15 cm). We found them sprinkled on the forest edge and carpeting small clearing on the forest floor. Most plants will have only 2 leaves, although some will have three. The stems zigzag between the alternating leaves, ends in a cluster of small white flowers at the top of the plant. Leaves are lance shaped and glossy, up to 3″ long and 2″ across. The article A Most Common Wilding sings the praises of Canada mayflower as a native groundcover for shade, sharing its adaptability to almost any soil type and association with a wide range of other plant species and ecosystems. The tiny flowers are visited by tiny creatures for pollen (no nectar! ), and the berries are nibbled by both furred and feathered beasts. The flowers are cross-pollinated by small bees, flies, and beetles. These floral visitors include Halictid bees (Halictus spp., Lasioglossum spp. ), Andrenid bees (Andrena spp. ), Syrphid flies, bee flies (Bombylius spp. ), and Anthomyiid flies. No nectar is available to floral visitors. The bees collect pollen, while the flies and beetles feed on pollen. The foliage is consumed by the introduced Lilioceris lilii (Lily Leaf Beetle), while the larvae of a fly, Dasineura toronotensis, cause fusiform galls to develop on the roots. The berries are eaten by the Ruffed Grouse, White-Footed Mouse, and Eastern Chipmunk; these animals (particularly the Ruffed Grouse) help to spread the seeds of this plant into new areas. The book “Wild Jams and Jellies: Delicious Recipes Using 75 Wild Edibles” states that the entire plant is edible, but only give recipes utilizing the fully ripened berries. I have not come across another reference that discusses eating the entire plant, and an article at borealforest.org notes: “Although the berries are edible, they tend to be bitter and may induce diarrhea.” I'm would suspect that the key to palatability is making sure that the berries are fully ripe and in good condition. The Wild Jams and Jellies book states that, “The ripened berries are tart, acidic, and fleshy and have a flavor of cranberries. The fruit contains high concentrations of vitamins A and C.” it provides three Canada mayflower jelly recipes, one conserve, one ginger sauce and instructions for drying. Several Canada mayflower recipes can be found at http://earthnotes.tripod.com/canmayflwr.htm, including basic Canada mayflower jelly. Use fully ripened berries and none that are puckered or dehydrated. Wash and stem berries and place in a saucepan. Add a little water, then cover and cook over a moderate heat till the fruit pops. Remove from heat and force through a jelly bag. Measure juice and add sugar as above. Bring to a boil and add the pectin and boil for 1 full minute while stirring constantly. Skim off foam, pour into hot, sterile jelly jars. Seal and process for 10 minutes in a boiling water bath canner. Native Americans used the plant for headache and sore throats. Used as an expectorant by folk healers. A root or whole plant tea is used. 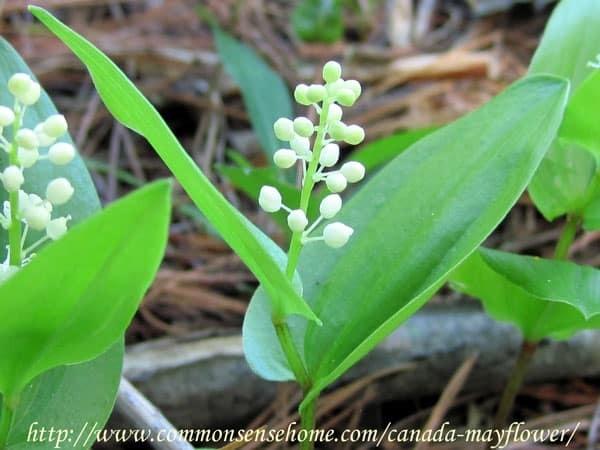 I first encountered it as false lily of the valley, too, in Wildflowers of Wisconsin, but when I started researching online I found that the name Canada Mayflower was used more frequently and several species were called false lily of the valley, so I decided to go with Canada Mayflower. Whatever you call it, it’s a lovely little plant. You’re welcome, Ravin, and thank you for noticing. So glad I found this- we have a patch in our yard- I am so happy to know what it is!